CONSIRT prioritizes international collaboration with OSU and PAN faculty, students, and alumni to produce high quality publications. Recently, projects supported by CONSIRT appeared in prestigious academic journals in sociology, political science, and economics, including: Current Sociology, Electoral Studies, European Sociological Review, International Journal of Sociology, International Review of the Sociology of Sport, Journal of Urban Affairs, Party Politics, Perspectives on European Politics and Societies, Polish Sociological Review, Survey Research Methods, Quality and Quantity, World Development. Since 2013, CONSIRT prepared six special issues of the International Journal of Sociology (Routledge: Taylor & Francis). In addition, CONSIRT faculty and affiliates published many chapters in edited volumes (e.g. Advances in Comparative Survey Methods: Multinational, Multiregional, and Multicultural Contexts, edited by T. P. Johnson, B-E. Pennell, I. A. L. Stoop, and B. Dorer, Hoboken, NJ: Wiley. 2018). CONSIRT administration and affiliates have written several books in the last few years. Unemployment and Social Structure: The Experience of Joblessness in Poland (expected 2019, Springer) combines qualitative and quantitative data from the Joblessness Project, conducted in Poland after the Great Recession, and from the long-term Polish Panel Survey POLPAN, to describe the lives of the jobless in contemporary Poland: women and men currently out of work, the recently re-employed, and housewives. 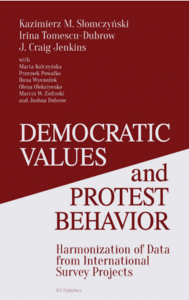 Survey Data Harmonization: Democratic Values and Protest Behavior: Harmonization of Data from International Survey Projects (Slomczynski, K. M, I. Tomescu-Dubrow, and J. C. Jenkins, with M. Kołczyńska, P. Powałko, I. Wysmułek, O. Oleksiyenko, M. W. Zieliński, and J. K. Dubrow. 2016. Warsaw, Poland. IFiS Publishers) details the logic of, and methodology for, creating the multi-year multi-country database needed for comparative research on political protest, which the Harmonization Project produced. The book concerns both the selection and ex-post harmonization of survey information and the manner in which the multilevel structured data can be used in substantive analyses. The book is available at asc.ohio-state.edu/dataharmonization. Elections and Accountability: Towards Electoral Control in Central and Eastern Europe (Dubrow, J. K. and N. Palaguta, Eds., 2016. Warsaw, Poland. IFiS Publishers). In modern democracy, voters should be able to use elections to control parties and politicians. Citizens lose control when their electoral voice does not compel parties and politicians to act according to the will of the people. Repeated free and fair elections are supposed to function as a mechanism of electoral control. To evaluate electoral control, citizens need the right data on candidates, parties, and parliamentarians. This book presents the methodology of the East European Parliamentarian and Candidate dataset (EAST PaC). These data are the universe of candidates and parties who stood for national parliamentary elections in Ukraine, Poland, and Hungary from the 1990s to the 2010s. Candidates are matched over time, rendering a dataset that allows researchers to track the political careers of every candidate, from the thousands who never won to the few political lifers whose parliamentary careers are decades long. With EAST PaC, scholars can achieve new insights into electoral politics of Central and Eastern Europe. The book is available at the project website, electoralcontrol.org. Class and Stratification in Poland since World War II: Dynamics of Class and Stratification in Poland, by a team of authors from CONSIRT and the Polish Academy of Sciences (I. Tomescu-Dubrow, K. M. Slomczynski, H. Domański, J. Dubrow, Z. Sawiński, D. Przybysz. 2018. Budapest and New York: CEU Press), draws upon decades of major social survey research to offer the rare comprehensive study of important changes to the social structure from the Communist era to the present. The core argument is that even during extreme societal transformations, key features of social life have long-lasting, stratifying effects. “The book carries important implications for the understanding of current socio-political change, not only in other post-socialist countries but in the modern world at large, and will be essential reading for a wide range of social scientists.” – John H. Goldthorpe, Emeritus Fellow, Nuffield College, University of Oxford. Valuable lessons follow from linking past to present. Classic issues of class, stratification, mobility, and attainment have endured decades of radical social change. These concepts retain their relevance even when society tries to eradicate them. Inequality in the Social Structure: Dynamics of Social Structure: Poland’s Transformative Years, 1988–2013 (Slomczynski, K. M and I. Tomescu-Dubrow, with D. Życzyńska-Ciołek and I. Wysmułek) and Social Inequality and the Life Course: Poland’s Transformative Years, 1988–2013 (Slomczynski, K. M and I. Wysmułek) were published in 2016 (Warsaw, Poland: IFiS Publishers). These two books, whose empirical foundation is the Polish Panel Survey 1988-2013, complement each other. They explore main social and economic phenomena that, across nations, are fundamental to transformations of the social structure: labor market processes, precarity, processes, mechanisms and consequences of inequality, and perceptions of attainment and of resource allocation. They also deal with core issues of political sociology, such as voting representation and political attitudes and knowledge. The idea of dynamic social structure implies that structures are changeable and produce tensions and conflict between people, groups, and institutions. The case of Poland demonstrates that social and economic phenomena related to the labor market remain major stratifying forces. Both volumes are freely available to the public at polpan.org. Political Inequality in an Age of Democracy: Cross-national Perspectives (Dubrow, J. K. Ed., 2014. London: Routledge). Political inequality – as structured differences in the influence over decisions made by political bodies and the outcomes of those decisions – is felt most acutely by the disadvantaged who remain outsiders to the political system they help to legitimize and whose interests are chronically underrepresented. Governments at all levels are places where access to political power is constrained and where benefits are allocated unequally. This book builds on previous work (e.g. APSA Task Force in 2004 on inequality and American democracy and Dahl’s On Political Equality) to address the present and future of the concept of political inequality from multi-disciplinary and cross-national perspectives. It is comprised of nine theoretical, methodological, and empirical chapters by both established and young, up-and-coming social scientists, including from Latin America, Eastern Europe, Greece, and the U.S. Prior to 2013, OSU and PAN students and alumni published two books on international politics – National and European? Polish Political Elite in Comparative Perspective (edited by W. Wesolowski, K. M. Slomczynski and J. K. Dubrow, 2010, Warsaw: IFiS Publishers), and Tożsamość, Zaufanie, Integracja (Identity, Trust, Integration, edited by W. Wesolowski and K. M. Slomczynski, 2012, Warsaw: IFiS Publishers). In 2017, CONSIRT facilitated the renewal of an agreement between The Ohio State University and the Polish Academy of Sciences to co-publish Ask: Research and Methods, an English language, international peer-reviewed social science methodology journal. Published annually since 1995 by IFiS PAN and indexed in leading bibliographic research databases, via the new agreement with OSU and a grant from the Polish Ministry of Science and Higher Education, Ask: Research and Methods (askresearchandmethods.org) has become an open access journal. OSU alumni involved with CONSIRT are on the editorial staff and editorial board. Graduate students from OSU and Poland work under the guidance of CONSIRT faculty as assistants in the process of academic publishing in the social sciences. ASK published leading methodologists from Belgium, Brazil, Germany, Poland, Romania, Spain, Switzerland, the UK, and the USA, among others. Survey data harmonization and big data are innovative forces that are leading to new, emergent, and interdisciplinary knowledge across the social sciences. The purposes of the Harmonization newsletter (consirt.osu.edu/newsletter/ ISSN 2392-0858), which appears bi-annually since 2015, are to share news and communicate with the growing community of scholars, institutions and government agencies who work on harmonizing social survey data and other projects with similar focus. We pay special attention to the methodology of survey data harmonization. We intend for this newsletter to contribute to the development of international research and standards on methodological issues such as data comparability, data quality, proper data documentation, and data storage and access, as well as analytic procedures that can contend with the demands of harmonized data.